"eggs have no business ..."
Monday's challenge for April 15th with art aMUSEment was to use an egg in our work. 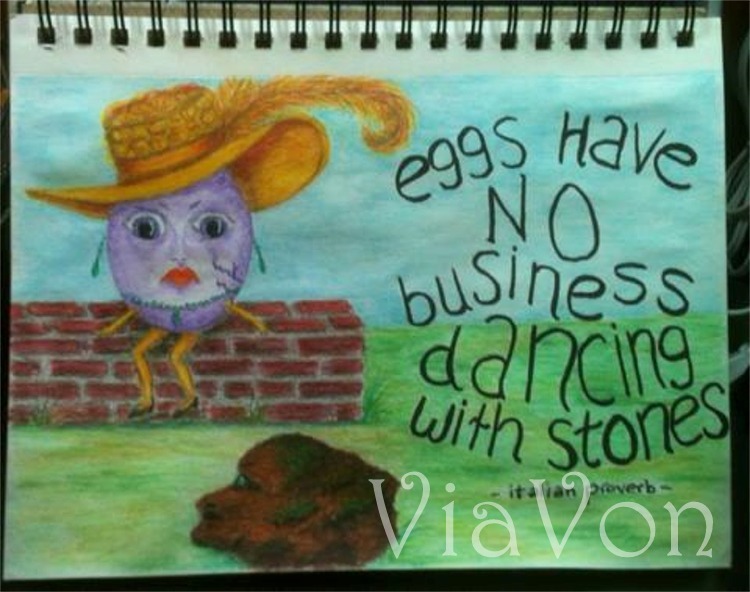 I Google'd "egg quotes" and found "eggs have NO business dancing with stones - an Italian proverb" and drew this sketch. I used watercolour pencils and then my aqua brushes to finish it. The virus landed in the middle of all that it wasn't submitted until late Sunday night ... just in time. Because I was not feeling ready to rock and roll at the painting table just yet, I spent the next few days working some more with my Prismacolor Coloured Pencils. They are a new (to me) medium and since I haven't played with them since childhood (eons ago O.o) I watched an assortment of YouTube videos to learn the basics. Then I spent some time playing with Strathmore Bristol paper to get a feel for them -- I was ready to put my knowledge to work! I found some images in my collections of freebies and began to colour and blend. Ohhhhhh how completely fun these coloured pencils are! This was done in my pink Smash travel journal for art aMUSEment's Monday, April 22nd's challenge to let a song inspire your art. I took an excerpt from "April Showers" as it was raining that day. lol The background was pre-existing paper within that journal which I then adhered shimmery metallic scrapbook paper bits onto. 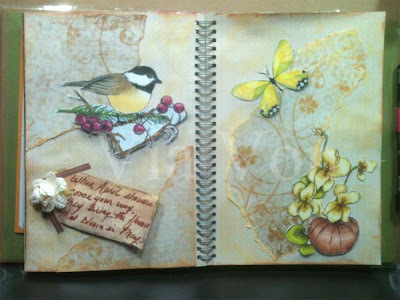 Page edges and tears along with general surface areas were distressed with tea stain and golden yellow chalk ink pads. 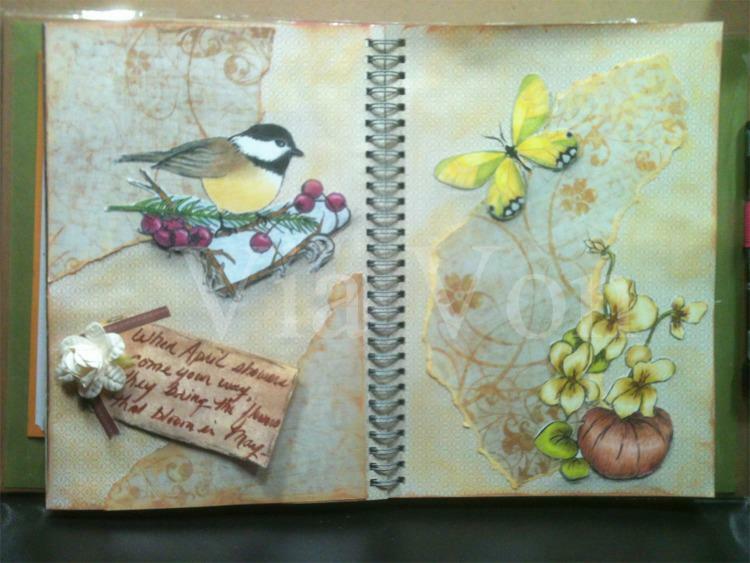 The chickadee, flower and butterfly were colour pencilled, cut and glued in place. (The Lion's Head flower image was a freebee gift via FaceBook of Whimsy Stamps LLC.) I look forward to working with the pencils some more -- they are deliciously fun! And that brings us to today where I'm really feeling quite well again! And to top it off, we received a text this morning from son, Bryan with dates that he and his family will be coming to spend with all of us in August! This has been a long time in the planning and we just couldn't be more thrilled to see actual dates set and plans being made to make it happen. What a wonderful day ... and my heart is full and happy. This page was done in my big "Memories" journal and was later tagged with a note dated today and the exciting news it brought. Background is watercolour washes of green, yellow and white blended and blotted with baby wipes. Stenciling of stars, butterflies, flowers and hearts. Scrapbook Paper cutouts are from a kit I found on huge clearance at Joann's some time ago called Die Cuts With a View - The Jewel Collection. It is SUCH a fun collection and I've wanted to use it for some time -- colourful, funky and bling built right in! And there ... I'm caught up! I hope life is treating you kindly! God bless! I am so glad that you are feeling a bit better and working on artful projects again! These are just great, Von! First, kudos for revamping and old nursery rhyme! Made me smile. I love the ones done with the colored pencils! I even love using a Crayola box of crayons to create! I don't have the DCWV Jewel Collection, but, as much as I like bling, not to mention this page, I should run out and get it! Thanks for sharing, my friend!